This month’s Project Spotlight features a major home addition for an active family of five. They enjoy the neighborhood where they live but it was time to add more space to their home. 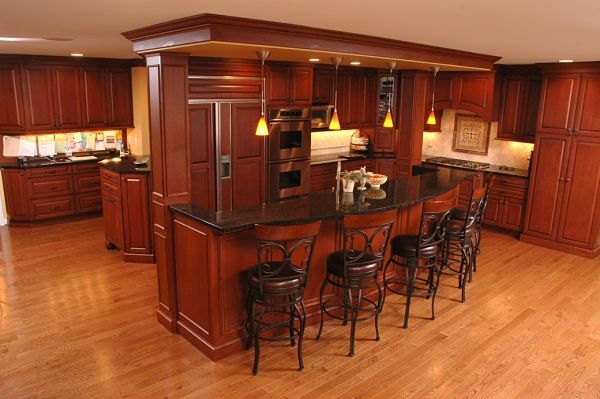 They needed an area for gathering and entertaining, and they wanted to expand the kitchen, garage and an entryway. The solution was an addition that created a family room and casual dining area, expanded the kitchen, added a new mudroom with a laundry area in the entryway, reconfigured a powder room and added another garage bay. This project incorporated many details, large and small. Add more living space to the home and match the addition to the architectural style of the home. The kitchen and current layout of the home no longer met the needs of the family. The homeowners wanted the addition to look like it was part of the original design of the brick colonial home and to blend with the structure. Expand and update the kitchen. The family had outgrown the u-shaped kitchen. It was confining for food prep, seating and interacting. Create a casual dining area. Dinner time is when the family gathers daily. It was important to have a space where the family could dine together comfortably. Provide an open space where the entire family can gather. With three school-aged boys in the home, it was important to create a comfortable environment, which all members of the family would want to use. Add more storage space. Storage was not only an issue in the kitchen, but would be needed in the entryway for jackets, coats, shoes and gear; in the laundry area for supplies and hanging wet clothes; in the family room for storing games and electronics; and in the garage for an additional car. Designing the expansion to comply with existing building codes and create new areas to the home without compromising the architecture of the existing exterior. Changes to the exterior of the home were dictated by variance and set-back restrictions. Creating a new design for the kitchen. This kitchen would be relocated in the home as part of the expansion. It would be integrated into an open floor plan and new mechanicals (plumbing, wiring and ventilation) would be required. Cabinet layout would have to consider fewer walls, location of work stations, the way people would use and move in the space and capacity for storage. Integrating the family room area with the kitchen. Visually and functionally the family room would need to complement the kitchen in an open floor plan. Redesigning and repurposing the entryway to include storage and a laundry area. More space and cabinet storage would be added. Replacing a screened-in room with an addition and expanded garage. 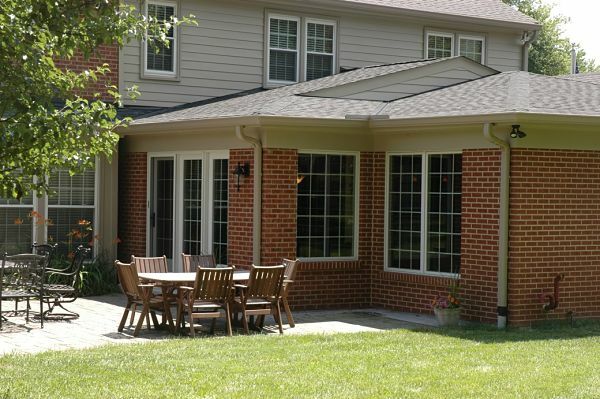 A screened “outdoor living room” would be removed. A third bay would be added to the existing garage and the driveway would need to be altered to provide access. 1. Build an addition to match the home’s architecture. The primary design objective was to provide a more comfortable living space, which the family would to be able to use without being crowded. The 595 square foot addition was arranged in an L-shape, with the arm of the L positioned against the house. This redesign resulted in the loss of the window in the powder room, but provided the space needed for a casual dining area and wet bar. 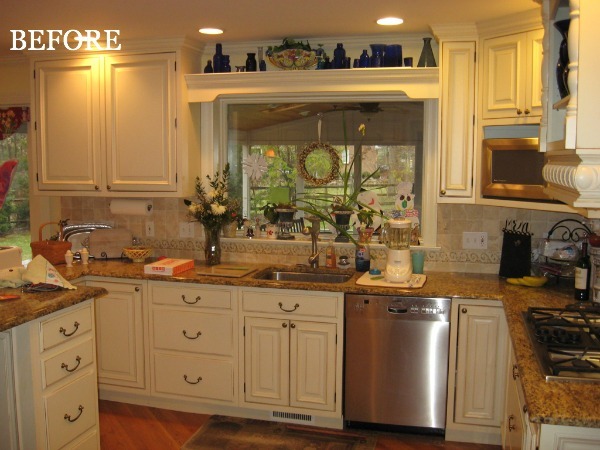 The kitchen space was increased from 210 square feet to 343 square feet. 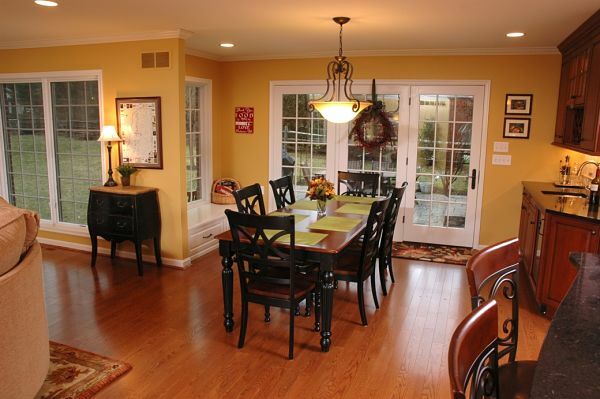 A 120 square foot breakfast area was replaced with a 150 square foot informal dining area. The addition would create space for a new 432 square foot family room with a fireplace, and built-ins. New and larger windows, as well as French doors on both sides of the addition would be used. The new structure would be surfaced with brick to match the existing home. Matching shingles and trims would also be selected. The kitchen was entirely re-organized and moved in the floor plan to allow for the inclusion of a larger casual dining area. The back hallway, leading into the kitchen from the enlarged mudroom and laundry room, would include a family “organizing station” and cabinet storage throughout. A five-seat, two-tiered island creates a delineating boundary between the new kitchen and the family room. The island is located near the original exterior wall, which was removed to open the space. One of the island columns is a structural support. The other was added for symmetry in the island design. 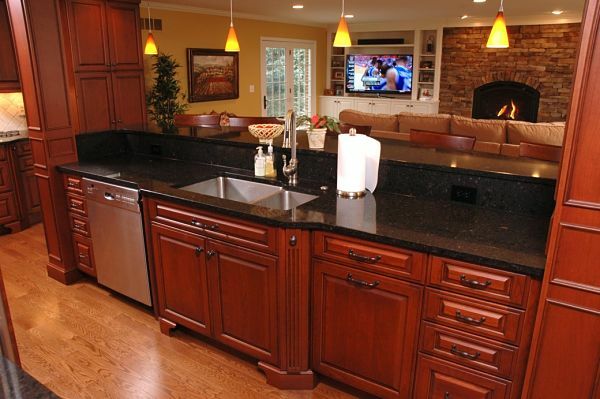 A sink and dishwasher are built into the island. The back wall of the kitchen includes a refrigerator, double wall ovens, microwave and cooktop. 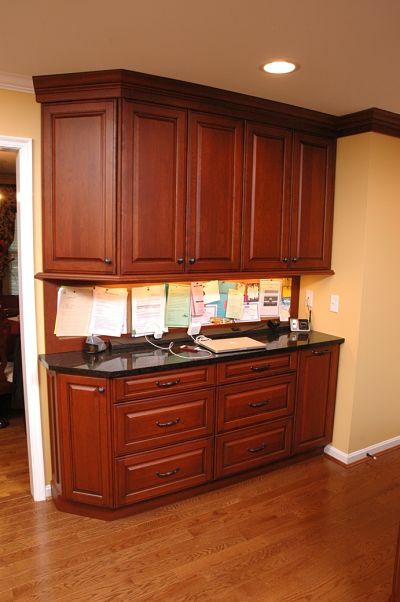 A custom vent hood and a mixture of cabinets create a cohesive and practical cabinet layout. While the details of the cabinets are traditional in style, the space feels transitional due to the modern layout. A pantry cabinet just outside of the kitchen offers convenient access to food and snacks for the family without the need to enter the work area. A stylish soffit over the island provides a platform for four glass pendant lights, and task lighting throughout illuminates workstations and accents the cherry cabinets. A bonus feature of the project was adding a new family organizing center in a hallway between the laundry room and kitchen. The center is equipped with plenty of storage for household items and a corkboard for messages and reminders. 3. Configure space for casual dining. The casual dining space was designed to provide room for a table that comfortably seats six and a wet bar. The bar area includes china cabinet storage. The bar is equipped with wine storage, a beverage cooler and sink. A custom corner fitted to the lower cabinets eliminated the potential hazard of a sharp counter corner. To take advantage of the existing patio, a door was included in this area to provide an exit to an outdoor dining area. A window seat was built in for linen storage and to provide overflow seating for guests. 4. Create an open family room. The main portion of the new addition was designed as an open space for the family room. Stone Craft “Chardonnay” Ledge Stone was used for the fireplace, offering a mixture of warm tones to help ground the room and tie it visually with the cherry kitchen cabinets. The simple design of the fireplace creates a focal point in the room. The family room was conceived as an area for large groups to enjoy. The space provides an open flow of traffic by creating aisles by design around the furniture, including a large sectional couch that might otherwise dominate the space. Lighting throughout provides various levels of illumination for any given situation, from ambient lighting on the fireplace, natural light provided by the windows and French doors, under cabinet lighting, recessed lights and lamps. 5. Expand the entryway to include a laundry/mudroom and add an additional garage bay. Space for the washer and dryer was achieved by removing a small powder room. 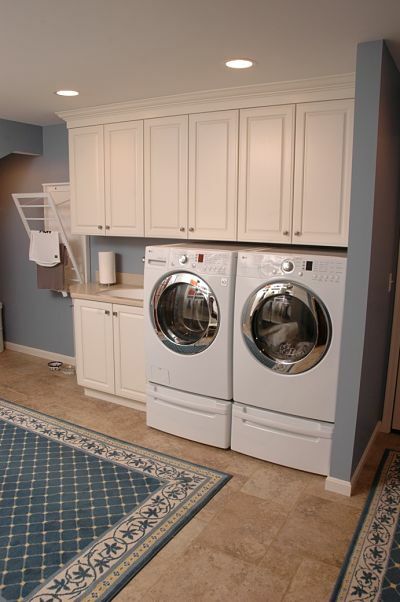 The floor space in the entry created an efficient laundry room. An existing laundry chute was left intact in the cabinet in the foreground. The wall leading to the back door was fitted with a set of cubbies to provide a drop zone for the family’s coats, bags and shoes. 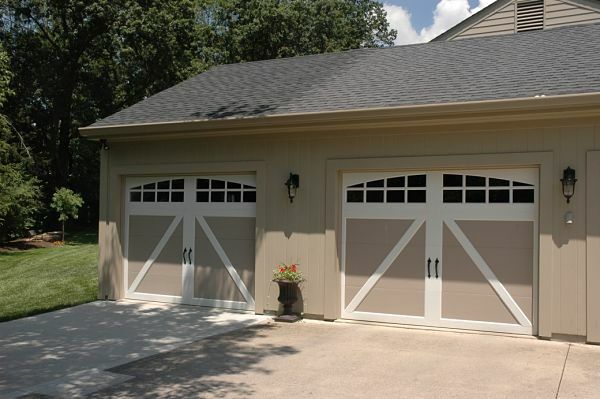 By matching the existing look of the garage doors to the new bay, square footage was added without compromising the architectural design. Siding, roofing and trims were matched to the home. The driveway was widened to accommodate the new bay.